Thorsteinssons LLP was founded in 1964 by P.N. Thorsteinsson, Q.C. Since then, Thorsteinssons has grown to become Canada's largest firm practicing exclusively in tax. Our practice encompasses all aspects of federal and provincial tax matters including tax planning, compliance, representation and civil and criminal tax litigation. Tax is an area of great complexity. By restricting our practice to tax, we are better able to provide the level of skill and attention demanded by our clients. Our level of specialization ensures that we complement – not compete with – other professional advisors representing our clients. We serve clients across Canada and around the world including a broad range of public and private corporations, domestic and offshore trusts, individuals, charitable and non-profit organizations and all levels of foreign and domestic government. 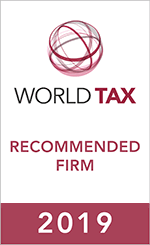 Our lawyers are consistently recognized among the leading tax practitioners domestically and internationally. Our lawyers teach at the university level, are frequent speakers at domestic and international conferences, author articles in a wide range of legal journals and serve on a number of government advisory committees. Our level of expertise is highly regarded in the legal, accounting and business community. Our reputation has been earned one client at a time and is backed by longstanding client relationships that are built on satisfaction and trust.